In the previous post, we have discussed Deadlock Prevention and Avoidance. In this post, Deadlock Detection and Recovery technique to handle deadlock is discussed. In this case for Deadlock detection we can run an algorithm to check for cycle in the Resource Allocation Graph. Presence of cycle in the graph is the sufficient condition for deadlock. 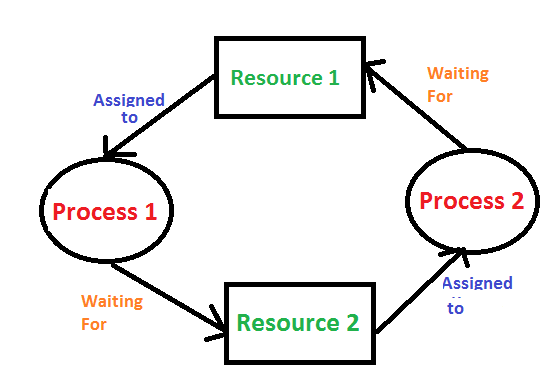 In the above diagram, resource 1 and resource 2 have single instances. There is a cycle R1 → P1 → R2 → P2. So, Deadlock is Confirmed. Detection of the cycle is necessary but not sufficient condition for deadlock detection, in this case, the system may or may not be in deadlock varies according to different situations. A traditional operating system such as Windows doesn’t deal with deadlock recovery as it is time and space consuming process. Real-time operating systems use Deadlock recovery. Killing the process: killing all the process involved in the deadlock. Killing process one by one. After killing each process check for deadlock again keep repeating the process till system recover from deadlock. 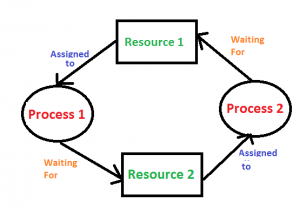 Resource Preemption: Resources are preempted from the processes involved in the deadlock, preempted resources are allocated to other processes so that there is a possibility of recovering the system from deadlock. In this case, the system goes into starvation.